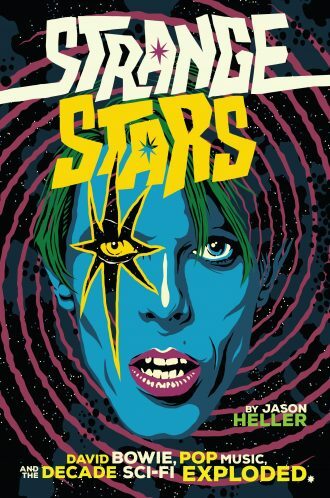 Jason Heller is not the first writer to take science fiction and its poets and musicians seriously, but you get the sense that Bolan was distinctly forecasting something like Heller’s new book, Strange Stars: David Bowie, Pop Music, and the Decade Sci-Fi Exploded. In it, the science fiction field – and specifically its impact and influence on the music of the 1970s – gets its due. Focusing on under-recognized connections and moments when the science fiction establishment embraced music, like when the animated Yellow Submarine film and Paul Kanter’s Blows Against the Empire earned Hugo Award nods — the equivalent of Emmys in sci-fi, Heller’s sharp, lyrical, and evocative pages bring the relationship between music and science fiction to life. Heller, the author of the satirical novel Taft 2012, whose work has appeared in Rolling Stone, Pitchfork, The New Yorker, and elsewhere, knows his stuff. Here, he connects Robert A. Heinlein’s Starman Jones to David Bowie’s Major Tom, traces hard SF pioneer Samuel Delany’s early forays into rock criticism for Crawdaddy, examines the “myth science” ethos of Sun Ra, how Michael Moorcock’s consciousness-expanding literature crossed over into the psychedelic rock of Hawkwind, and explores a dozen more corners of the pop spectrum where the influence of the space program, technological advancements, experimental science fiction novels, and films gave musicians license to showcase their most propulsive ideas. Though his original idea for the book was to broadly chart science fiction’s influence on pop music — encompassing everything from Billy Lee Riley’s 1957 rockabilly rave-up “Flyin’ Saucers Rock & Roll” to Janelle Monî¡e’s current Do Androids Dream of Electronic Bangers aesthetic — Heller instead chose to focus on the 1970s, a decade that found the tone and character of pop music tilting toward potential ideas about the future. But while Heller free ranges across genre, certain characters emerge as pivotal figures. George Clinton, leader of the funk collective Parliment/Funkadelic, steps forward as a spacey pioneer, as does Sun Ra, whose sci-fi blacksploitation film Space is The Place and sprawling discography stand as foundational works of Afrofuturism. But no figure looms larger in the book than David Bowie. “Early on, the voraciously bookish Bowie absorbed not only Heinlein, but the works of other sci-fi luminaries such as Ray Bradbury and George Orwell, whose classics The Illustrated Man and Nineteen Eighty-Four would prove to be vital influences as he became popular music’s ethereal, mercurial ambassador to science fiction,” Heller wrote for Pitchfork following Bowie’s passing early in 2016, as he was working on the book. Though Bowie’s relationship with the genre was conflicted, reverent one minute, dismissive the next (“Bowie liked to contradict himself,” Heller says) the influence of science fiction shades his work immensely, from the otherworldly character of Ziggy Stardust to the 1976 film The Man Who Fell to Earth, culminating in the dark, alien themes of his final record, Blackstar. 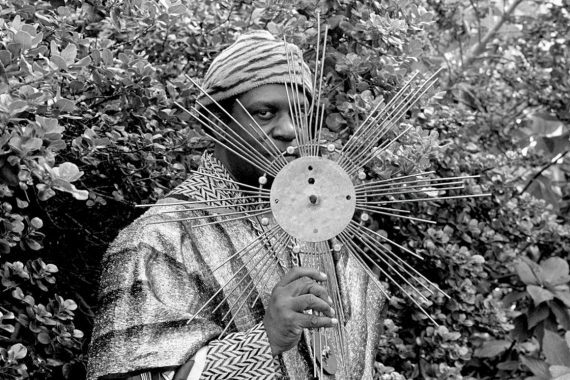 Like Sun Ra, Clinton, and the many others chronicled in Strange Stars, Bowie used science fiction as a means to invent himself. He used its idea to create a world in which his music lived and resonated. Though Heller’s book ends as the ’80s begin, with its synth pop, video culture, and an entirely different Star Wars, artists continue to tap into the spirit of science fiction. In addition to untold numbers of symphonic metal releases each year, artists like the Hugo Award-nominated clipping., Shabazz Palaces, and Janelle Monî¡e use the genre’s framework to create bold, fascinating new work. 2018 feels rife with science fiction moments. The president can’t stop going on about Elton John and Bernie Taupin’s mournful “Rocket Man.” On his new album Heaven and Earth, saxophonist Kamasi Washington offers “The Space Travelers Lullaby”; drone metal titans Sleep’s new album The Sciences is a weed-laced sci-fi saga; noted sci-fi aficionado Daniel Lopatin’s new LP as Oneohtrix Point Never, Age Of, takes on the trappings of classic high concept SF, owing as much to space opera as the dense historical mythology Lopatin cites. We’ve even reached the point of long deceased artists being digitally reincarnated as holograms, a dystopian nightmare straight out of Blade Runner.